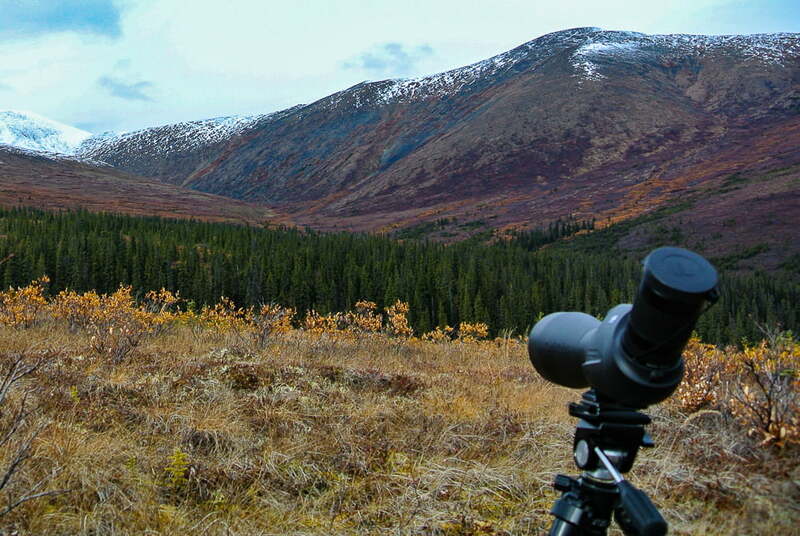 Back in 2012, I took a Zeiss Diascope 85 T FL spotting scope with me to Alaska on a moose hunt. At that time, the Diascope had been updated with rubber armoring and a clever dual-rate focus mechanism over the previous Diascope of similar design. The spotter offered great brightness and very good centerfield performance. It came in handy when I discovered the shed that I spotted with my binos at two miles was actually a bedded bull… a bedded bull I ended up putting my tag on. Later, I moved on to Swarovski’s excellent ATX 85 spotter after comparing it directly to its super-spotter rival, the Kowa Prominar 88. 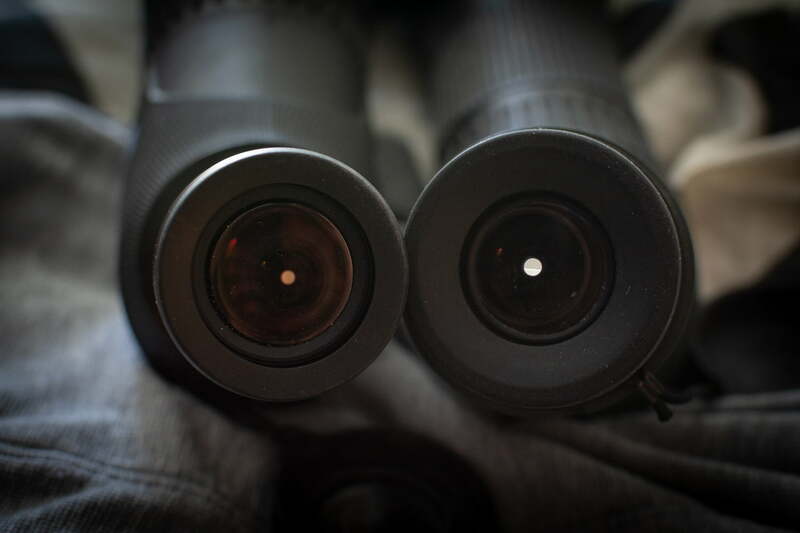 These two spotters showed clear improvement over the Diascope’s optics while the Swarovski also added objective-swapping modular convenience and a center body helical zoom ring. I looked at a number of very good spotters in the following years, but still found the ATX at the top of the heap for me. The combination of top-shelf optics, sturdy build, and great armoring kept me coming back to it. In the meantime, Zeiss maintained the Diascope as their top spotter while introducing the Conquest Gavia in their mid-pried lineup. The Harpia is a substantially new design for Zeiss. It has a helical focus and center body helical power ring like the Swarovski. Unlike the Swarovski, the prism is in the body, while the eyepiece is detachable like traditional spotters. The power ring is marked in numbers from one to three for the “times zoom” rather than traditional magnification. The helical focus ring is of the dual-rate design introduced in the Diascope I had previously used. This functions as a fine focus and coarse focus. Turn the ring quickly to make a fast, coarse adjustment, then come back slowly the other way, and the slow, fine focus engages. 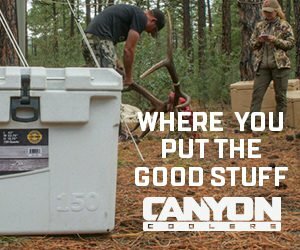 The system seems complex, but after a little use, it becomes pretty intuitive. The entire scope is covered in a high quality armor and has a tight finish and feel. The coatings are dark and uniform. The internals appear well-blackened and baffled. The mount is rotatable and apparently the foot is replaceable as hex screws are visible. This leaves me hope that Zeiss or a third party could offer an Arca-compatible foot in the future. The bayonet mounted eyepiece is a fixed focal length, as the zooming is accomplished in the body internals. 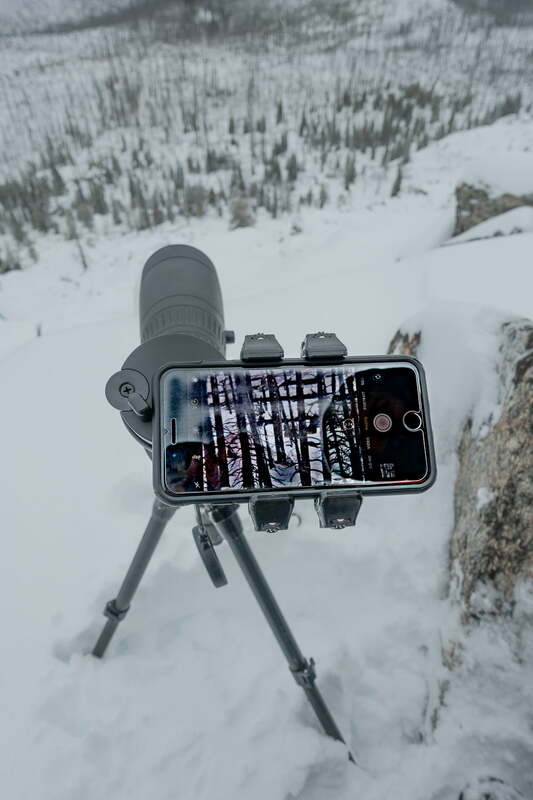 The eyepiece is a very uniform shape, which makes mounting a digiscoping adapter like the Novagrade phone adapter a breeze. 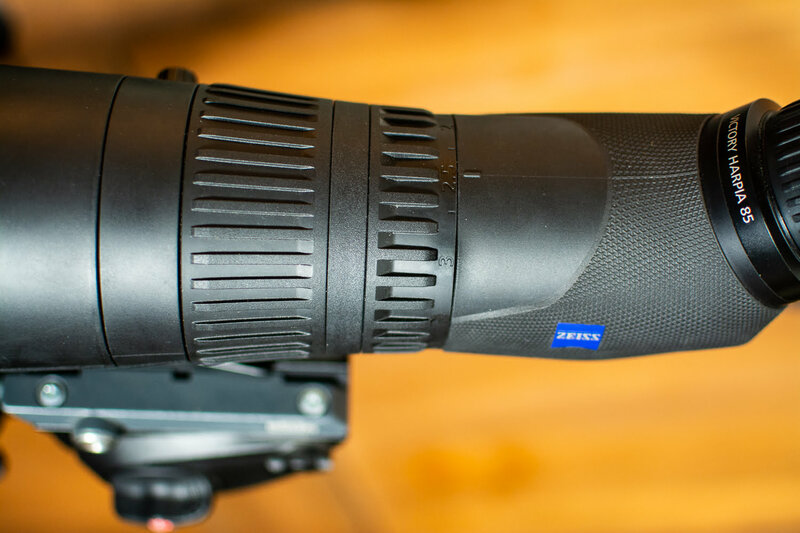 Zeiss has a an extendible hood included that works well. With the eyepiece attached, the Harpia is 16.5 inches long and 4 lbs. 11.7 ounces. Compare this to the ATX 85 at 15.25 inches long and 4 lbs. 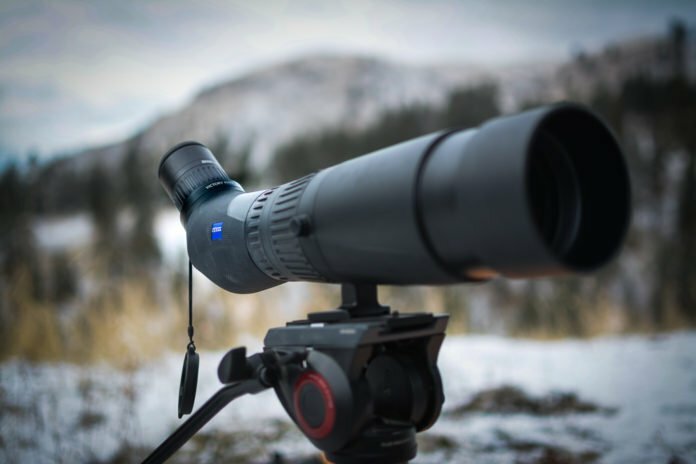 5.1 ounces, and the hunter can see a significant nearly half pound weight penalty with the Zeiss. The Harpia 85 and eyepiece will cost the hunter $4500. That is even more than the Swarovski ATX 85’s already steep $4100. The first and most impressive optical impression the Harpia presents to the viewer is the stunningly wide field of view (FOV). This was clearly a top design goal for Zeiss, and it does impress. The apparent field of view maintains 72 degrees from the lowest magnification (22X) to the highest (65x). In linear terms (at 1000 yards) this equates to 189 feet at 22x to 63 feet at 65x. Compare this to the Swarovski’s 124 feet at 30x and 68 feet at 60x. 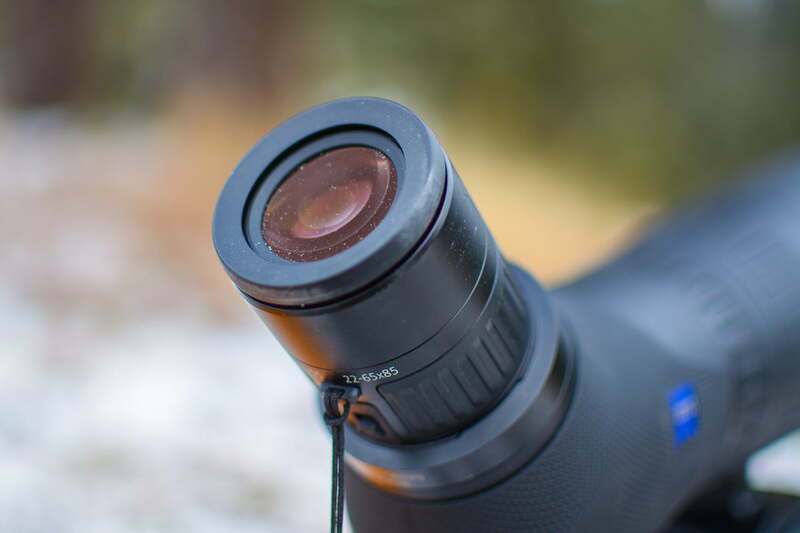 The Harpia’s wide AFOV and thin eyecup design combine to allow for easy vignette-free digiscoping with a variety of cameras. At maximum magnification, the Harpia’s centerfield resolution is indistinguishable from the ATX. Here, we get our first clue, though, that there is something unique going on with the Harpia. It seems like the scope at lower powers isn’t really the same scope at all as the scope at higher powers. At lower powers, the amazingly wide FOV shows a greater amount of blur than the ATX. Also there is visible CA at the edge of the field and is even visible in some instances near the center. Turn the power up, however, and edge sharpness is improved, as well as CA control. The Harpia is definitely at its best at the highest powers. The Harpia also has a very nice deep depth-of-field for a spotting scope. Low light testing showed a very competitive performance at the highest power, but we once again have the tale of two scopes happening with the Harpia. At lower powers, the Swarovski really starts to have a brightness advantage over the Zeiss. So much so, I investigated further, finding that the exit pupil doesn’t continue to grow as it should with an 85mm spotter as the power is turned down. At the bottom power of 22x, the exit pupil seemed significantly smaller than it should, and the difference with the Swarovski was stark. Using the normal formula to calculate exit pupil (objective diameter divided by magnification), the Zeiss should have an exit pupil that measures 3.86mm (85 / 22). However, it clearly is obviously smaller than the Swarovski’s 3.4mm exit pupil at 25x. Confused, I went to the Zeiss Hunting website, and sure enough, the exit pupil specs list the maximum exit pupil at 2.5mm at 22x. There is only one explanation: The Harpia is internally closing the clear aperture to 55mm when zoomed out to the minimum aperture. So the Harpia at 65x is using the full 85mm objective, but the nearly 5 pound spotter is effectively a 55mm spotter at 22x. It really IS a different scope depending on magnification setting. This is even more pronounced in the 95mm Harpia, as its lowest power exit pupil is also 2.5mm, meaning it has an even greater disparity than the 85mm model. The Harpia 85 is a very sturdily built spotter with great, textured rubber armor that was good for using in cold, snowy conditions. Durability was not an issue and I felt no need to baby the instrument in the field. 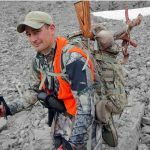 Optical performance was really good at high powers, allowing for close inspection of bull elk over 2000 yards away on one occasion. 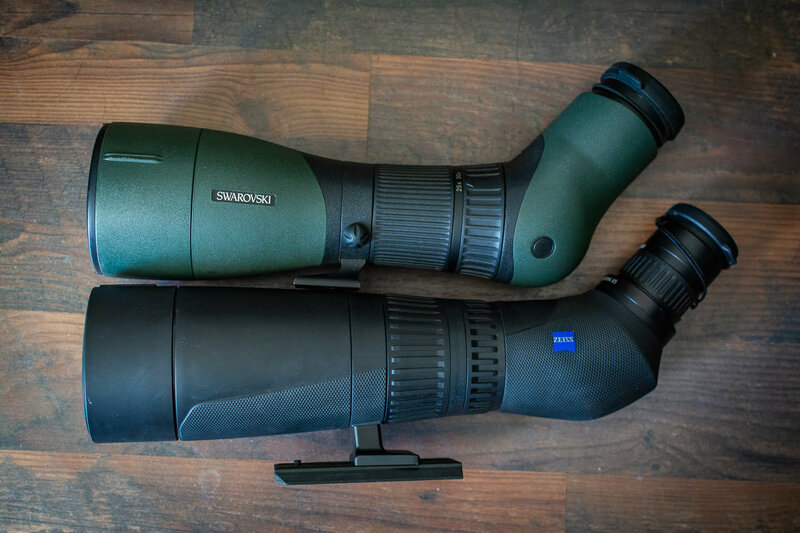 The ultrawide FOV and eyepiece design made affixing digiscoping devices a breeze, and I really liked the Harpia for digiscoping. Not being able to benefit dialing the scope down for maximum brightness was frustrating on a couple of low light glassing occasions. Optical designs are always a balance of design goals. It seems like Zeiss was really aiming at the wide angle viewing experience with the Harpia. In this they succeeded, providing a constant 72 degree AFOV throughout an impressive 3x zoom ratio. They did this in a sturdy, quality rubber armored housing with a clever focusing system and convenient zoom location. Hunters will find the super-wide FOV a real asset when covering large amounts of countryside scanning for game. Digiscopers will find the Harpia’s mounting options easy to get along with. However, the Harpia is a big, heavy, expensive spotting scope. Combine that with a constricted exit pupil at low powers and the subsequently handicapped low light performance will keep the Swarovski ATX in my personal pack when choosing between these top spotters.